Red Deer Rustlers celebrating first playoff action this weekend at Gary W. Harris Canada Games Centre with free admission! After a successful inaugural season in the North Central Hockey League, the Red Deer Senior Rustlers are set to take on the other new kids on the block, the Sylvan Lake Pirates in the first round of the NCHL playoffs. 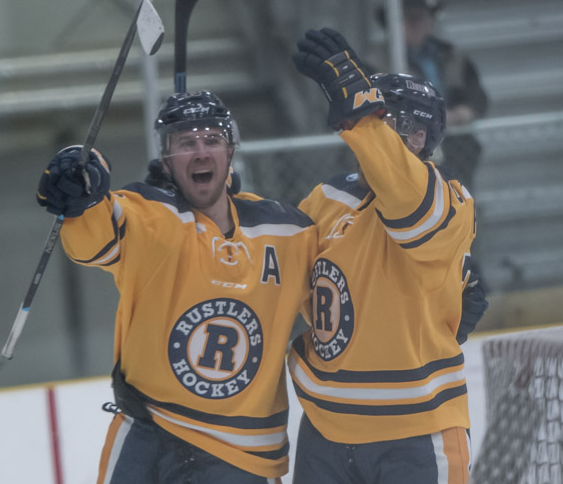 The second-place Rustlers drew the seventh-place Pirates in the first round, a fitting matchup for the Central Alberta rivals both looking to make a mark in their first NCHL seasons. With home-ice advantage, Red Deer will host Sylvan Lake for Games 1 and 2 of the best-of-five series on Saturday, January 26 and Sunday, January 27. Saturday’s game is set for 12:30pm at the Gary W. Harris Canada Games Centre. To celebrate the very first playoff game for both teams, admission to the game will be free for all fans, with a guaranteed $500 take-home prize for the 50/50. Game 2 goes Sunday night at 7:30pm at the Collicutt Centre, with free admission for season ticket holders. Games 3 and 4 are slated for February 2nd and 3rd in Sylvan Lake, with Game 5 scheduled for February 8 at the Penhold Regional Multiplex. For more information on the Red Deer Senior Rustlers, contact rdsenioraarustlers@gmail.com, or follow the team on Instagram, Twitter and Facebook.